Tom’s Take On Things has teamed up with Bloggin Mamas and Niagara Conservation for this wonderful giveaway. It’s time to dispose of your old ideas about toilets! Niagara Conservation has a solution to wipe out water waste and to cut your water/sewer bills in half. It’s a no-brainer to want to save money, especially with the new year creeping up on us. It’s a great time to do a budget and stick to it for your New Year’s resolution. We have a great giveaway ahead to help you save money in your home. First, check out the Too Smart To Waste page for more detailed information. One lucky reader will receive a Phantom Toilet, complete with a UHET Water Saving Kit, a total value of $300+. Disclosure: Giveaway begins December 6th, 2018 at 12:00 am and ends December 19th, 2017 at 11:59 pm EST. Open to US residents age 18 and older. 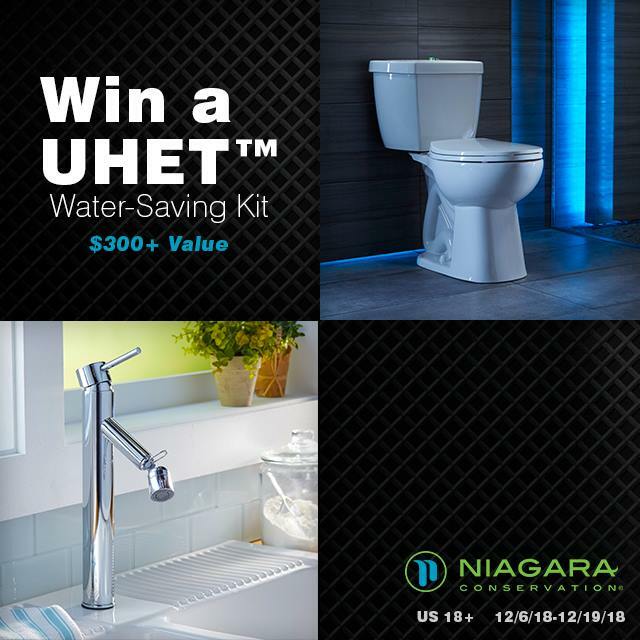 One (1) UHET™ Water-Saving Kit containing the Niagara Phantom toilet, along with three high-efficiency showerheads and aerators will be awarded to one (1) winner. Total ARV of $300 per prize pack. Winners will be selected by Random.org and be notified by email. Winners have until December 22nd, 2018 at 11:59 am EST to respond or forfeit their prize. Facebook, Twitter, Instagram, Pinterest, Youtube, and Google are in no way associated with this giveaway. By providing your information in this form, you are providing your information to Heather Lopez Enterprises LLC. We do not share or sell information and will use any information only for the purpose of contacting the winner. This would be great. Saving all of that money I could get a newer car. I like that the toilet is a natural water saver. Our water and sewer bill are high in our own. This would be beneficial. By saving money it would free up more to enjoy ourselves. I am saving up for a home as live in an older mobile home. This toilet would be perfect to save money in my new home and would help me with bills that have cut into my savings. i would love to win this for my home! our toilet is OLD and i mean OLD!! it came with the house! I love that this toilet saves money and water useage! i also like that there No clogging due to a high-pressure flush and a fully glazed trapway! this is a must with kiddos! mine flush od things every now and then! Wow! What a great giveaway! If I were to save all this money on water I could afford a three day cruise!! !